The passing of Norrie Woodhall on 25th October 2011 has left a huge void in all of our lives. Norrie was an exceptional and inspirational lady, well known, well respected, and well loved. Norrie was born in The Central Temperance Hotel, South Street, Dorchester, just a few yards from here, and was the last of the Hardy Players, the Dorchester drama group, who, with Thomas Hardy’s blessing, formed in 1908 to perform plays based on his novels. Norrie was born to act and as a young girl she loved to peep through a hole in the curtain to watch the Hardy Players rehearse in the dining room of her home. As soon as she was old enough she joined them, and during the First World War, as part of a group called The Gypsies, would recite poems for the soldiers who were camping on Poundbury. Norrie was a natural actress, a talent which certainly did not diminish over her long life. And that is exactly what happened. 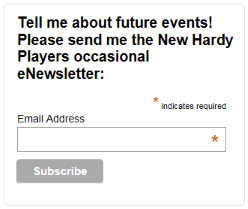 The New Hardy Players were formed, and Norrie’s birthday wish was the start of seven incredible years. And so Norrie’s new life began. Not only did she act in some of the productions, she also co-wrote A Life of Three Strands, a play about Hardy’s life. In 2006 she published Norrie’s Tale … The last of the Hardy Players , a fascinating read about old Dorchester and her memories of Hardy and the Hardy Players. And amazingly at the age of 104, Norrie published her second book, which records the incredible events which have happened since her centenary. At 100 years old and rising, Norrie never flinched from the many and varied events which followed; one of which was taking a taxi to London, where she had not been since the 1960s, to watch the premiere of The Heart of Thomas Hardy, a film about Hardy’s life in which she had starred. Another part of Norrie’s birthday wish was to promote Thomas Hardy and the Dorset both he and she loved, and also to raise money for her favourite charity, the Weldmar Hospicecare Trust. To date £33,500 has been raised for the Hospice, and through a programme called Dorset Voices a further £14,000 has been raised for Dorset churches and other local causes, something which Norrie loved to be involved in. Her recitation of Hardy’s The Ruined Maid in her natural Dorset dialect, and her heartfelt reading of The Voice can never be recaptured. The huge list of Norrie’s achievements is astounding, not least her prompt response to Jon Murden’s appeal in 2009 to secure a collection of Hardy manuscripts, which looked set to go to America. A fundraising drive included a Dorset Voices style evening , which included an auction. Norrie gave one of her paintings to be auctioned, and recited two poems. The whole event was a huge success, and along with publicity, largely generated by Norrie being there, donations came in, £60,000 was raised, and the manuscripts were saved. In 2010 Norrie had a special request; she asked if Tess of the d’Urbervilles could be performed by the New Hardy Players. Plans were made, everything was set in motion, and the premiere was held here in Dorchester at the Corn Exchange on 3rd June 2011: The very stage where Norrie had played Liza-Lu in the 1924 production. It was truly magical for us all to have dear Norrie, our President with us on that evening. Norrie told us that she was very happy to see it again, and especially loved the two dairymaid’s scenes, one of which sees Angel carrying the maids over the water, both of which were not included in the original production. Norrie was also delighted that the extra line which Hardy had given her back in 1924, was included. There are many coincidences between Norrie and Thomas Hardy, one being that in his later years Hardy derived much pleasure from the Hardy Players, and likewise, Norrie found enormous happiness from being with and watching the New Hardy Players. We, as a group, all feel so fortunate to have known Norrie; and so very privileged to have shared those last, special years with her. Norrie was a remarkable and extraordinary lady; like many Dorset folk, she was fiercely independent and always true to herself. Dorset was her life and in her last years she brought Dorset back to life through the New Hardy Players. We thank her for showing us a more rounded view of Hardy, and will ensure that through our future productions her memory will live on. We miss her very much and will never forget her. How fitting that the day dear Norrie died, Thomas Hardy had his second death. A few years ago, BBC Radio 4 recorded a programme about Norrie and how her wish resurrected the troupe to form The New Hardy Players. President of the Thomas Hardy Society, Julian Fellows, recalls the stories from 100 years ago, and interviews present members.